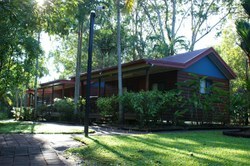 Situated at the top of Cape York, the lodge offers affordable four star luxury, being the premier accommodation and hospitality provider on the top of Cape York. It provides the ideal getaway for families, corporate and government travellers, special interest and conference groups. If you like adventure, fishing, boating, island hopping, 4x4 driving and the outdoor life, then this is the place for you. 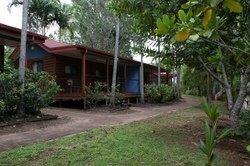 Rooms range from twin/double/suites to cabins and all have air conditioning and en suite facilities. The resort features a fully licensed a-la-carte restaurant, swimming pool, BBQs, and conference facilities. Car hire is available at the resort.